We are delighted to announce the appointment of Dr. David Juncker to the position of Chair, Department of Biomedical Engineering, Faculty of Medicine, McGill University. Dr. Juncker succeeds Dr. Robert Kearney, the Department’s founder, who has been serving as Interim Chair since 2013. Included among the highlights under Dr. Kearney’s direction are the successful launch of a new Graduate Certificate Program in Translational Biomedical Engineering, the development of the Graduate Tracking System - an automated tool integrated with McGill IT systems for the management and tracking of graduate students that is now being used throughout the Faculty of Medicine and the University - and the recruitment of key tenure-track and non-tenure track faculty. We take this opportunity to thank Dr. Kearney for his exemplary leadership during this period and wish him continued success. Dr. Juncker joined McGill in 2005 as an Assistant Professor in the Department of Biomedical Engineering. He became an Associate Professor in 2011 and Full Professor in 2016. Dr. Juncker graduated with a degree in Electronics-Physics in 1996 from the Institute of Microtechnology, University of Neuchâtel, Switzerland. After an internship at the Swiss Center for Electronics and Microtechnology, he spent a year in Japan as a Visiting Scientist at the Metrology Institute of Japan in Tsukuba. Upon his return to Switzerland, he started his PhD in Micro and Nanotechnology at the IBM Zurich Research Laboratory and University of Neuchâtel, earning his doctorate in 2002. Before joining McGill, he embarked on Postdoctoral fellowships in microfluidics and bioassays at the IBM Zurich Research Laboratory and the Swiss Federal Institute of Technology in Zurich. Dr. Juncker's area of research is micro and nanobioengineering, with the goal of creating novel micro and nanobiotechnologies for miniaturizing, parallelizing and empowering biological assays and medical analysis. Applications include biomarker discovery and diagnostics for cancer and infectious diseases, as well as microscale tissue engineering for neuroscience and cancer. Dr. Juncker pursues interdisciplinary research in collaboration with scientists, engineers, and clinicians, as well as industry partners, striving to address grand challenges in the life sciences and healthcare using small technologies with a big impact. Keeping with his interdisciplinary interests, Dr. Juncker is a PI at the McGill University and Genome Quebec Innovation Centre, and an Associate Member of the Department of Neurology and Neurosurgery; the Department of Electrical and Computer Engineering; the Division of Experimental Medicine; the Department of Surgery; and the Goodman Cancer Research Centre. As Chair, Dr. Juncker will lead the Department of Biomedical Engineering in its research and education missions as part of the Faculty of Medicine and McGill University. He will provide mentoring to faculty throughout their careers, lead strategic planning for the Department, and participate in Faculty and University activities. Please join us in welcoming Dr. David Juncker to this new position and in wishing him every success in his efforts to advance biomedical engineering in the service of knowledge, healthcare, and society. 2017 November 1 - New Graduate Program Director. Professor W Robert J Funnell has been appointed BME Graduate Program Director and BBME Graduate Program Associate Director. Today, the Royal Society of Canada (RSC) announced the induction of 89 new Fellows, nine of whom are McGill researchers and scholars. The new group of Fellows will be formally inducted into the RSC on November 24, in Winnipeg. 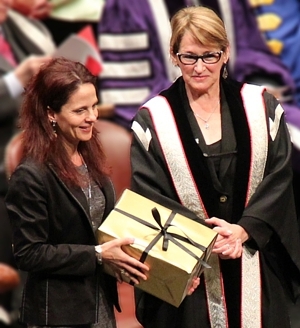 Included among this cohort is Professor Maryam Tabrizian, who is the first member of McGill’s Faculty of Dentistry to become an RSC Fellow. The RSC consists of over 2,000 Fellows selected by their peers for outstanding contributions to the natural and social sciences, arts and humanities. The RSC works to advise governments and organizations while recognizing academic excellence in Canada. A new graduate certificate recognizes that many basic science degree holders go on to work in the applied sciences, and is offering a few tools to better navigate that transition. The Graduate Certificate in Translational Biomedical Engineering, which will be led by Dr. Ahmad Haidar, Assistant Professor in the Department of Biomedical Engineering at McGill University, and is currently being phased into the course calendar, will cover industry-relevant subjects for graduate students, particularly those looking to branch out into the medical devices field. The Department knew that building a program from scratch would require a couple of years. So, instead it decided to bring in one core course at a time, and make them available to their current students. Once the three new core courses would be in place, so would the graduate certificate. Biomedical Regulatory Affairs – Medical Devices, which lays out the various government requirements for medical devices. The courses are rolling out one semester at a time, with Patents having begun this past January, Regulatory Affairs to be introduced this fall and Clinical Trials launching January 2018. Patent agent Pierre Nguyen and regulatory affairs consultant Danny Kroo have been hired for those first two courses, while the Department is in the process of recruiting a clinical trials professional for the January course. The certificate will be aimed at graduate students who want to work in the field of medical devices, Master’s and PhD students in various engineering disciplines who want to augment their training and people already working with the devices who want to further develop knowledge in those specific areas. 2017 May 29 - BME welcomes two new Assistant Professors - Dr. Christine Tardif and Dr. David Rudko - joint appointment with Department of Neurology and Neurosurgery. Among McGill's newest CRCs are Dr. Ahmad Haidar, CRC in Artificial Pancreas Systems, CIHR, Tier 2 and Dr. Nicole Yee-Key Li-Jessen (BME Associate Member), CRC in Personalized Medicine of Voice Disorders, CIHR, Tier 2. “They weigh a few hundred grams and hold in the palm of a hand. On the contrary, we managed to save these premature babies by just 24 weeks of pregnancy. But neonatologists sometimes feel that they are playing Russian roulette when it comes to withdrawing respiratory assistance from these very premature babies, a problem that Montreal researchers have decided to look into.” Project APEX collaborated by Dr. Guilherme Mendes Sant'Anna, Montreal Children Hospital, Dr. Kearney’s group, Department of Biomedical Engineering and Dr. Precup’s group, School of Computer Science at McGill was featured in La Presse. Full story (in French) in Lapresse. Aquaculture, the farming of fish, shellfish and aquatic plants in fresh or seawater, is a rapidly growing Canadian industry. There is a great need for highly sensitive, rapid and user-friendly field deployable monitoring tools for detection of trace amount of contaminants in natural water systems, as well as for tools to conduct water quality surveys, identify and assess source of point and non-point pollution, establish concentration limits and classify harvest areas based on the analysis. This project will develop a portable detection system combining an aptamer-based analyte enrichment mechanism, and a microfluidic chip for hands-off processing, integrated with a sensitive graphene-based sensor. The project will establish a novel analyte enrichment and detection technology that is capable of ultra-high sensitivity, reaching detection limit not achievable by current field deployable methods. Through the Staff Recognition Program, each year we receive official McGill pins for the regular employees who have achieved milestones of 15, 20, 25, 30, 35, 40, 45 and 50 years of continuous service to the university. This year, we congratulate people for their milestone and thank them for their great contribution to the department and the university. In a 2016 collaborative agreement between the governments of Canada and China, the Chinese Ministry of Science and Technology has finalized areas of collaboration including 5 life health science projects. Our ongoing research supported by the CIHR Cardiovascular Respiratory Institute/Canadian Blood Service partnership grant is one of these 5 projects. This is the innovative research by Chang’s group at McGill University on a novel soluble nanobiotherapeutic complex with enhancement of all 3 red blood cell functions. Potential health benefits include emergency on the spot transfusion in severe hemorrhagic shock since this has no blood group; the soluble complex can better perfuse partially obstructed blood vessels in stroke & heart attack; the lyophilized complex, unlike red blood cell, can be heat sterilized to inactivate infective agents in natural or man made contaminated donor blood risks; the lyophilized complex is also more stable with a storage time at room temperature of more than 100 days compared to 1 day for donor red blood cells. This also utilizes and conserves donor blood that is needed for many other important uses. Much more extensive and costly research is needed to move this towards clinical uses. The Blood Transfusion Institute of the Chinese Academy of Medical Sciences is our Chinese collaborator with extensive experience in the scale up of an earlier first generation blood substitutes. They will have their own research support from China in collaborate with our Canadian supported research so that we can together move this towards clinical use earlier. The result from this collaboration will be shared towards the design for future preclinical and clinical trials and the production of this in both countries for patient use. 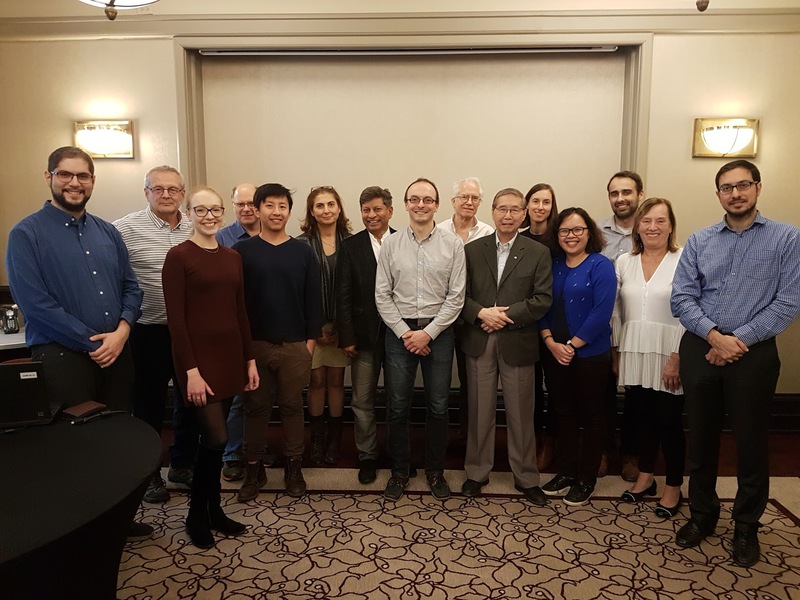 JDRF and McGill University are pleased to announce research occurring to improve a platform designed to aid in glucose control for those living with type 1 diabetes. The artificial pancreas platform is a system of devices that closely mimics the glucose regulating function of a healthy pancreas. Dr. Ahmad Haidar was awarded $466,450 (USD) to study the effect of co-administering insulin with pramlintide (a hormone that helps regulate blood sugar) and its effect on improving the glycemic performance relative to the insulin-alone artificial pancreas. The first steps to better cancer treatment start with identifying the disease. Over at the McGill University and Génome Québec Innovation Centre, Dr. David Juncker and his team are investigating cancer diagnostics and screening technologies in the Micro & Nano Bioengineering Lab. One tool is a filtration technique to isolate cells that could be linked to cancer, based on size, but also based on molecular features. The initial work was done at the McGill Nanotools Microfab, a facility dedicated to developing micro- and nanotechnologies, says Juncker, a Canada Research Chair in Micro- and Nanobioengineering and Professor in Biomedical Engineering at McGill. The microfabricated filters are engineered to catch circulating tumour cells, which could signal whether cancer has spread. “The next step is to go to the clinic and try this setup with patient samples,” Juncker says. Juncker’s lab is also developing microfluidics and microarrays, both of which are techniques using “lab-on-a chip” technologies that function like mini-laboratories, testing samples for particles that could point to cancer. The goal is to use biomarker signatures with the new technologies in diagnostics for cancer patients. Using blood samples and microarrays—chips with dots that measure proteins—Juncker and his team are looking to identify breast cancer biomarkers, which are molecules released by tumours. These molecules are signs that cancer is present in the body. For the full story see the Medicine Focus magazine. Lunch reception held on April 14 to welcome new BME recruit, Dr. Ahmad Haidar, to the position of Assistant Professor (Tenure-Track). Welcome Ahmad! Congratulations to Prof. David Juncker upon his promotion to Full Professor. It is a well-deserved recognition! Congratulations to Prof. David Juncker upon his promotion to Full Professor – Well deserved recognition!Professor Juncker earned his PhD from the University of Neuchâtel in Switzerland. He joined McGill in 2005. His research focus is on the miniaturization and integration in biology and medicine, which includes using micro- and nano-technology in the study of proteins, cells and tissues. He has developed a multipurpose fluidic probe, which can be used for making micro-arrays, manipulating single cells, and for the study of cell migration and diagnostics. He is an associate member of the Departments of Surgery, Medicine, Neurology and Neurosurgery, Bioengineering and Electrical and Computer Engineering. Known as the “father of artificial cells”, Prof. Chang created the first artificial cell in the world in 1956, which brought forth many ground-breaking approaches in human health and other applications. Professor Emeritus in the departments of Physiology, Medicine and Biomedical Engineering and Director of the Artificial Cells and Organs Research Centre at McGill, to this day Prof. Chang continues his research and innovative work to better the future of humankind. He was awarded Officer of the Order of Canada and was twice nominated for the Nobel Prize. In 2011, Dr. Chang was voted the winner of the Greatest McGillian contest organized by the McGill Alumni Association for McGill’s 190th anniversary. For the full story see the the Live 2015 of the Med-eNews. Standing at the booth are Student Affairs Officer Pina Sorrini (3rd from left), Dept. Chair Robert Kearney (4th from left), and some attending BME students. The new program Biological and Biomedical Engineering was being promoted at the IEEE EMBC conference. 2014 Dec 18 - Chair re-appointed. Professor Robert Kearney has been reappointed as Interim Chair for an additional two years, effective Jan. 1, 2015. Dr. Kearney has accepted this reappointment to provide some stability and continuity in this leadership role within the Department. The longer term also allows Dr. Kearney to continue his efforts in strengthening the relationship with Bioengineering with the ultimate goal of establishing a structure beneficial to both faculties and departments. “I wouldn’t trade my job for anything. I love it! I love helping students in any way I can. Even if sometimes it’s just as someone to listen to them when they need to talk.” - Pina Sorrini, Student Affairs Officer in the Department of Biomedical Engineering.